Liquor pourers help bar owners keep their liquor costs under control with exact servings. We are a leading restaurant supply distributor of bar pourers. Update International Stainless Steel Jiggers One - 1.5 Oz. Update International Stainless Steel Jiggers 0.75 One - 0.25 Oz. Update International Stainless Steel Jiggers - 1.5 Oz. Update International Stainless Steel Jiggers Half Size - 1.5 Oz. Pourer Black Speed - 10 Oz. Pourer Premium Black Collar - 1 Oz. 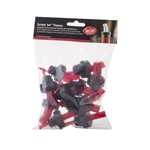 Pourer Premium Red Black Collar - 1.25 Oz. Pourer Premium Flip Top Blue Black Collar - 1 Oz. Pourer Premium Flip Top - 1.5 Oz. 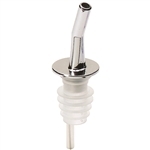 Our liquor supply pourers and jiggers are top of the line for bars and restaurants.